You would think flamingos and storks would be family, especially when seeing them together in wetland areas of Cuba or Hispaniola. But scientists continue to debate the classification of these birds. Once placed in the same order -- Ciconiiformes -- flamingos have been reclassified. And the shoebill stork stands alone in taxonomy. Of course, this all depends on what you are reading. Taxonomy is an every evolving exploration. Ask the flamingos and storks. Before the advent of DNA sequencing, the natural world was ordered on the basis of morphology -- traits from appearance to behavior to color and size. As the old adage goes: If it looks like a duck, walks like a duck and quacks like a duck, it must be a duck. But, the duck-billed platypus is a mammal that lays eggs. Scientists, using refined tools, are advancing the understanding of biological relationships. Storks and flamingos both have long legs and slender bodies. Their beaks are quite different. The flamingo's distinctive black beak is curved downward. Storks have long, pointy beaks designed for fishing and stabbing. There are 19 species of storks worldwide. Most of these storks live in tropical climates. The wood stork -- Mycteria americana -- breeds in Florida, South Carolina and Georgia. Nonbreeding flocks have been seen in California and Delaware. The flamingo's diet gives them the pink hue. 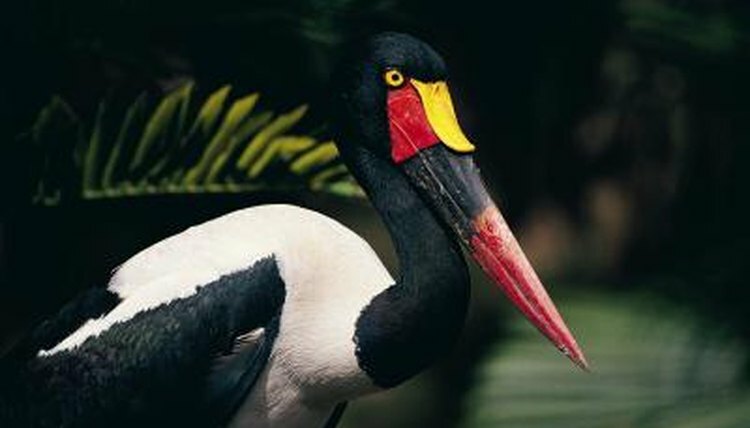 Their beaks help them scoop food from the water. There are six species worldwide, classified as New World and Old World. Old World flamingos live in southern Europe, Africa and southwest Asia. New World flamingos live in the Caribbean and parts of South America. New research suggests flamingos are more closely related to grebes, a freshwater diving bird that looks nothing like a flamingo. The shoebill stork -- Balaeniceps rex -- looks prehistoric. This stork stands up to 4 feet tall. Its name comes from its distinctive, 12-inch long, 5-inch wide beak. Tampa's Lowry Park Zoo was "the first wildlife institution in the North America to hatch a shoebill stork chick, and just the second institution worldwide." These solitary birds have been given their own order -- Balaenicipitiformes -- and their own family name -- Balaeniceps. International Crane Foundation: What Species Am I Seeing?